Various Blank Forms For Specification Of Premises, Building, Etc. (a) On or before __________ Tenant's space planner, at no cost to Landlord, shall prepare and deliver to Landlord a space for the Premises, showing the proposed location of all partitions and doors and the layout of the Premises. The selection of Tenant's space planner shall be subject to the approval of Landlord. (b) Within seven (7) business days after receipt of the space plan, Landlord will approve or disapprove it in writing, and if disapproved Landlord will provide Tenant with reasons for disapproval. Tenant will within three (3) business days after the receipt of Landlord's written disapproval cause the space plan to be revised (to satisfy Landlord's objections) and resubmitted for Landlord's review. The foregoing process shall be repeated until Landlord has approved the space plan (such space plan, when approved by Landlord and Tenant, is referred to as the "Space Plan" below). (c) On or before ___________, Tenant's space planner will meet with Landlord's Representative and Tenant's Representative to discuss the preparation of a summary of the interior design and color scheme for the Premises (the sum of the design and color scheme approved by Landlord is referred to as the "Design and Color Scheme" below) and to discuss request for any product specifications for materials, products, finishes and work desired by Tenant that Landlord does not consider to be standard for the Building (the list of such product specifications prepared by Tenant's designated space planner and approved by Landlord, if any, is referred to as the "Above-Standard Product Specification List" below). (d) Without limiting Landlord's right to disapprove of any plans and specifications submitted by Tenant's space planner, it is understood that: (i) the Space Plan must be compatible in Landlord's judgment with the use for which space in the Building is generally leased, (ii) the Design and Color Scheme must (a) conform to the design criteria from time to time established by Landlord for the Building, and (b) be compatible in Landlord's judgment with the design and colors of existing finished space in the Building, and (iii) in no event will Landlord be responsible for the function and maintenance of the Tenant's Improvements (as defined below which are different than Landlord's Building standard improvements. (e) After receipt of Landlord's written approval of the Space Plan, the Design and Color Scheme and any above Standard Product Specification List (as the same may be revised from time to time with Landlord's written approval), Tenant's space planner or an engineer selected by Tenant with Landlord's approval will prepare - if required by Landlord or necessary for construction - more detailed construction plans (any such detailed construction plans approved by Landlord, together with the Space Plans, the Design and Color Scheme and any Above-Standard Product Specifications List, are collectively referred to as the "Construction Plans" (see below) for the improvements contemplated in the Space Plan, the Design and Color Scheme and any Above Standard Product Specification List (such improvements are referred to as the "Tenant's Improvements" in this Agreement). Such detailed construction plans may include drawings for partitions, doors, reflected ceiling, telephone outlets, electrical switches and outlets, and Building standard heating, ventilation and air conditioning equipment and controls. Within seven (7) business days after any more detailed construction plans are delivered to Landlord, Landlord shall approve or disapprove the same in writing, and if disapproved Landlord shall provide Tenant reasons for disapproval. Tenant will cause the more detailed construction plans to be revised (to satisfy Landlord's objections) and resubmitted for Landlord's review within three (3) business days after the receipt of Landlord's written disapproval. The foregoing process shall continue until the more detailed construction plans are approved by Landlord. (f) All Construction Plans must be approved by Landlord in writing prior to the commencement of construction of Tenant's Improvements. (a) Tenant will construct the Tenant's Improvements in a good and workmanlike manner in accordance with the Construction Plans using _____________________ (such contractor or contractors are collectively referred to below as "Tenant's Contractors", whether one or more). Such construction and the cost of preparing the Construction Plans will be at Tenant's expense; but Landlord shall provide Tenant with an Allowance in the amount specified on page one of this Agreement. The Allowance shall be used only for payment of the sums to be paid to Tenant's Contractors for construction of Tenant's Improvements ("Actual Costs") and fees of Tenant's space planner and engineer (the Actual Costs and the fees of Tenant's space planner and engineer are collectively referred to as the "Construction Costs" below). In no event will any unused portion of the Allowance be applied against Rent under the Lease Agreement or be paid as a cash advance to Tenant. (b) If the Construction Costs estimated by Landlord exceed the Allowance, Tenant will deposit a sum (the "Construction Deposit" equal to the excess with Landlord prior to the commencement of any construction. Such deposit will either be (i) cash or (ii) in the form of a letter of credit from a financial institution and containing such provisions as are approved in writing by Landlord (The Construction Deposit, if any, and the Allowance are collectively referred to as the "Available Construction Funds" below). (c) Should Tenant's Contractor require to be paid in stages as Tenant's Improvements progress in substantial accordance with the Construction Plans, Landlord shall make disbursements from the Available Construction Funds to Tenant's Contractors, provided the following conditions shall be satisfied: (1) Landlord shall have received executed lien waivers for all work completed as of the date of payment; (2) all work shall have been completed as of the date of payment, in the sole judgment of Landlord is in a good and workmanlike manner; (3) Landlord shall be entitled to retain a ten percent (10%) statutory retainage to protect the Premises from future mechanic's liens; and (4) Tenant shall have complied with such other requirements as Landlord may reasonably impose shall have been satisfied. (d) If any portion of the Available Constructions Funds remains unexpended after the payment of the Construction Costs, then the unexpended portion of the Available Construction Funds will be repaid to Tenant (the "Repayment"); provided, in no event will the Repayment exceed the cash (if any) deposited with Landlord as the Construction Deposit. (e) If the Construction Costs exceeds the Available Construction Funds, Tenant must pay all such excess costs. (f) Tenant will not make any cuts in the roof. All roof cuts will be made by Landlord. Notwithstanding any provision to the contrary in the Lease or this Agreement, the commencement date of the Term (as defined in the body of the Lease) will occur no later than the Deadline for the Commencement Date (as defined on Page 1 of this Agreement). In addition, Tenant must cause Tenant's Improvements to be substantially completed no later than 90 days after such deadline for the Commencement Date. (a) Prior to the commencement of construction, Tenant must obtain, and must thereafter maintain, all insurance required of Tenant in the body of the Lease and any other exhibits. Tenant's Contractors and other agents of Tenant must obtain certificates for workmen's compensation, public liability and builder's risk insurance, all in amounts and with companies and on forms as Landlord may consider necessary or appropriate for its protection. Evidence of such certificates, in such form as required by Landlord, must be delivered to Landlord before the commencement of construction of Tenant's Improvements. (b) Landlord shall not be liable for any injury, loss or damage to any of Tenant's installations or decorations made prior to the Commencement Date. Tenant shall indemnify and hold harmless Landlord, Landlord's Representative and any other agent of Landlord from and against any and all costs, expenses, claims, liabilities and causes of action arising out of or in connection with work performed in the Premises by Tenant, Tenant's Contractors or any other agent of Tenant. THE WARRANTIES HEREIN EXPRESSED ARE EXCLUSIVE AND IN LIEU OF ALL OTHER WARRANTIES (INCLUDING IMPLIED WARRANTIES AND LIABILITIES BY REASON OF THE CONSTRUCTION OF SAID IMPROVEMENTS OR OTHERWISE. Landlord warrants the improvements, if any, constructed on the Premises by Landlord for the Tenant named herein (but not improvements constructed for and used by any prior tenant, with respect to which Landlord makes no warranty whatsoever) for a period of one year from the commencement date of the Lease against all material defects (including latent defects) and agrees during such period to correct such defects upon receiving written notice thereof from Tenant. LANDLORD'S LIABILITY UNDER THIS WARRANTY SHALL BE LIMITED STRICTLY TO THE COST OF CORRECTING SUCH DEFECTS AND SHALL IN NO EVENT INCLUDE CONSEQUENTIAL DAMAGES. SUCH WARRANTY SHALL NOT COVER ANY DEFECTS, DAMAGES, OR REPAIRS CAUSED BY OR RESULTING FROM, DIRECTLY OR INDIRECTLY, THE MOVEMENT OF THE SOIL DUE TO CHANGES IN MOISTURE SATURATION. LANDLORD MAKES NO WARRANTY OR REPRESENTATIONS, EXPRESS OR IMPLIED, AS TO THE SUITABILITY OF THE PREMISES OR AS TO IMPROVEMENTS CONSTRUCTED BY TENANT OR TENANT'S CONTRACTORS. (a) Purpose of Work Letter Agreement. The purpose of this Agreement is to set forth how the Base Building Improvements (as defined in Section 3(b) below) and the Tenant Improvements (as defined in Section 5 below), are to be constructed, who will undertake the construction of the Base Building Improvements and the Tenant Improvements, who will pay for the construction of the Base Building Improvements and the Tenant Improvements, and the time schedule for completion of the construction of the Base Building Improvements and the Tenant Improvements. (b) Incorporation of Lease Definitions. Except as defined in this Agreement to the contrary, all terms utilized in this Agreement shall have the same meaning ascribed to them in the Lease. When work, services, consents or approvals are to be provided by or on behalf of Landlord, the term "Landlord" shall include Landlord's agents, contractors, employees and affiliates. (c) Incorporation of Lease Terms. The provisions of the Lease, except where clearly inconsistent or inapplicable to this Agreement, are incorporated into this Agreement. (d) Landlord to Pay for Base Building improvements. The Base Building Improvements shall be constructed pursuant to this Agreement by Landlord at Landlord's sole cost and expense. (e) Tenant Improvement Allowance. The Tenant Improvements shall be constructed by Landlord, at Tenant's expense, subject to Landlord's obligations to provide the Tenant Improvement Allowance as described in Section 6 below. 2. Lease Commencement Date. 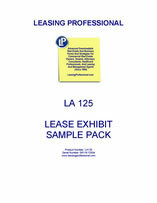 The "Lease Commencement Date" shall be the date which is the earlier of (i) the date Landlord delivers to Tenant written notice stating that the Premises are Substantially Complete (as defined in Section 2(a)(i) below), and (ii) the date Landlord delivers to Tenant written notice stating the date the Premises would have been Substantially Complete were it not for any Tenant Delay (as defined in Section 2(a)(ii) below). (i) The term "Substantially Complete" or "Substantial Completion" as used in the Lease or this Agreement shall mean: (1) the shell and core of the Building are complete and in compliance with all applicable laws, statutes, codes, rules and regulations (collectively, "Laws") and all of the Building's heating, ventilating, air-conditioning ("HVAC") and plumbing, life safety, mechanical and/or electrical systems (collectively, "Building Systems") are operational to the extent necessary to service the Premises; (2) Landlord has sufficiently completed all the work required to be performed by Landlord in accordance with this Agreement (except minor punch list items which Landlord shall thereafter promptly complete); (3) Landlord has obtained a certificate of occupancy for the Building, or a temporary certificate of occupancy (except to the extent delayed by any Tenant Delay); and (4) Tenant has been provided with the number of parking privileges and spaces to which it is entitled under the Lease. (ii) The term "Tenant Delay" as used in the Lease, or this Agreement shall mean any delay that Landlord actually encounters in the performance of Landlord's obligations under the Lease because of: (1) delay attributable to changes in or additions to the Final Plans (as defined in Section 3(d) below) following approval by Tenant; (2) delay attributable to the postponement of any Tenant Improvements at the request of Tenant; and (3) delay by Tenant in the submission of information or the giving of authorizations or approvals within the time limits set forth in this Agreement; and (4) delay attributable to the failure of Tenant to pay, when due, any amounts required to be paid by Tenant pursuant to this Agreement. Tenant shall pay all actual costs and expenses incurred by Landlord which result from any Tenant Delay, including, without limitation, any actual costs and expenses attributable to increases in the cost of labor or materials. No Tenant Delay shall be deemed to have occurred unless and until Landlord has given written notice to Tenant specifying the action or inaction by Tenant which Landlord contends constitutes a Tenant Delay. If such action or inaction is not cured within two (2) business day after receipt of such notice, then a Tenant Delay, as set forth in such notice, shall be deemed to have occurred commencing as of the date Tenant received such notice and continuing for the number of days the Substantial Completion of the Premises was in fact delayed as a direct result of such action or inaction. (iii) The term "Force Majeure Delay" as used in the Lease or this Agreement shall mean any delay in the Substantial Completion of the Tenant Improvements which is attributable to any: (1) actual delay affecting the Building, attributable to any strike, lockout or other labor or industrial disturbance (whether or not on the part of the employees of either party hereto), civil disturbance, future order claiming jurisdiction, act of the public enemy, war, riot, sabotage, blockade, embargo, inability to secure customary materials or Tenant's special requirements, supplies or labor through ordinary sources by reason of regulation or order of any government or regulatory body or lack of availability; (2) delay attributable to the failure of Landlord to secure building permits and approvals (including any failure to obtain a temporary certificate of occupancy), despite Landlord's best efforts to obtain such permits and approvals, within the same time period that normally prevailed for obtaining such permits and approvals at the time this Lease was negotiated, which time period Landlord and Tenant hereby stipulate to be one hundred and twenty (120) days; (3) delay in completing the Final Plans, the construction of the Tenant Improvements, and/or Tenant's move into the Premises because of changes in any Laws or Building Requirements (as defined in Section 3(b) below), or the interpretation thereof; or (4) delay attributable to lightning, earthquake, fire, storm, hurricane, tornado, flood, washout, explosion, or any other similar industry-wide or Building-wide cause beyond the reasonable control of the party from whom performance is required, or any of its contractors or other representatives. Any prevention, delay or stoppage due to any Force Majeure Delay shall excuse the performance of the party affected for a period of time equal to any such prevention, delay or stoppage (except the obligations of either party to pay money, including rental and other charges, pursuant to the Lease). No Force Majeure Delay shall be deemed to have occurred unless and until the party claiming such Force Majeure Delay has provided written notice to the other party specifying the action or inaction that such notifying party contends constitutes a Force Majeure Delay. If such action or inaction is not cured within one (1) business day after receipt of such notice, then a Force Majeure Delay, as set forth in such notice, shall be deemed to have occurred commencing as of the date such notice is received and continuing for the number of days the Substantial Completion of the Premises was in fact delayed as a direct result of such action or inaction. (b) Delay of Rent Commencement Date. 3. Construction Schedule and Procedures. (a) Selection of Designer. Tenant has selected ________________ as its architect and designer ("Designer") who will be familiar with all applicable Laws and Building Requirements (as defined in Section 3(b) below). (b) Base Building Plans. Landlord has submitted instructions and Building plans and specifications prepared by ____________ and described on the attached Schedule 3 ("Base Building Plans") and the improvements detailed therein ("Base Building Improvements") and all rules, regulations, instructions and procedures promulgated by Landlord with respect to tenant design and/or construction in the Building (collectively, "Building Requirements") sufficient to allow Tenant to complete a Space Plan (as defined in Section 3(c) below). To the extent the Base Building Plans are revised to accommodate the requirements of the City of _________ during the permit approval process, Landlord shall submit such revised plans to Tenant for its approval, which approval shall not be unreasonably withheld. (c) Preparation and Approval of Space Plan. Tenant shall submit to the Designer all additional information including occupancy requirements for the Premises ("Information") necessary to enable the Designer to prepare a space plan showing all demising walls, corridors, entrances, exits, doors, interior partitions, and the locations of all offices, conference rooms, computer rooms, mini-service kitchens, and the reception area, and other requirements of Tenant ("Space Plan"). Once completed the Space Plan shall be attached hereto as Schedule 1. Tenant shall cause the Designer to submit to Tenant and Landlord the Space Plan with sufficient time to ensure that Landlord can complete its review and Tenant and Landlord can finally approve the Space Plan no later than __________. (d) Integration of Final Plans and Construction of Tenant Improvements. Tenant's Designer shall integrate the Space Plan and any working drawings or engineering drawings that may be required in order to construct the Tenant Improvements as shown on the approved Space Plan into the plans, specifications and drawing for the Base Building Improvements, which integrated drawings ("Final Plans") shall be thereafter delivered by Tenant to Landlord with sufficient time to ensure that Landlord and Tenant can finally approve the Final Plans no later than _____________. (e) Bidding. As soon as practical following receipt of all necessary permits and approvals, Landlord shall put the Final Plans out to bid to multiple licensed and insured subcontractors. Tenant may submit subcontractors to Landlord for Landlord's review. Landlord, with input from Tenant, shall select which subcontractors will perform the Tenant Improvements. (f) Notice of Substantial Completion. Landlord shall deliver to Tenant one (1) week's prior written notice stating the date that the Premises are expected to be Substantially Complete, or would be Substantially Complete were it not for any Tenant Delay. 4. Change Orders. In the event that Tenant requests any changes to the Final Plans after such plans have been approved by Tenant and Landlord, Landlord shall not unreasonably withhold its consent to any such changes, and shall grant its consent to such changes within three (3) business days after Landlord's receipt of same, provided the changes do not adversely affect the Building's structure, systems, equipment or appearance. If any changes requested by Tenant and approved by Landlord increase the cost to Landlord of constructing the Tenant Improvements shown on the Final Plans, Landlord shall provide Tenant invoices documenting and evidencing such increased costs, and Tenant shall reimburse Landlord for such increased costs as provided in Section 8. The costs charged by Landlord to Tenant pursuant to this Section shall be an amount equal to the actual costs incurred by Landlord to review the requested changes and to cause the Tenant Improvements, as reflected by revised Final Plans, to be constructed above the costs that Landlord would have had to pay to cause the Tenant Improvements to be constructed if such changes had not been made. Subject to Section 2(a)(ii) above, if such changes delay Landlord's completion of the work shown on the Final Plans, then such delay shall constitute a Tenant Delay. 5. Tenant Improvements. The term "Tenant Improvements" shall mean all improvements shown in the Final Plans other than the Base Building Improvements. Tenant Improvements shall not include any personal property of Tenant. 6. Tenant Improvement Allowance Amount. Landlord will pay on behalf of Tenant an amount equal to __________ Dollars ($_______) per rentable square foot of the Premises, for an approximate total of __________________ Dollars ($________) ("Tenant Improvement Allowance") over and above the items included in the Base Building Improvements, as set forth in the Base Building Plans, for the costs of the design and construction of the Tenant Improvements. The Tenant Improvement Allowance shall be used to pay for permitted Tenant Improvements and shall be disbursed by Landlord to the contractor engaged to construct the Tenant Improvements. (d) All direct and indirect costs of procuring, constructing and installing the Tenant Improvements in the Premises, including, but not limited to, a construction fee not to exceed 10% for overhead and profit, and all labor (including overtime if requested and approved by Tenant) and materials. (e) All fees payable to the General Contractor, architect and Landlord's engineering firm if they are required by Tenant to redesign any portion of the Tenant Improvements following Tenant's approval of the Final Plans. 8. Excess Tenant Improvement Costs. Prior to commencing the Tenant Improvements, Landlord shall submit to Tenant a written statement of the actual Tenant Improvement Costs (the "Actual TI Costs") (which shall include the amount of any overtime projected as necessary to Substantially Complete the Tenant Improvements by the Completion Date if the necessity of using such overtime to meet the Scheduled Completion date was made necessary by a Tenant Delay) as then known by Landlord, and such statement shall indicate the amount, if any, by which the Actual TI Costs exceeds the Tenant Improvement Allowance (the "Excess Tenant Improvement Costs"). The term "Excess Tenant Improvement Costs" shall also include the costs related to any and all Change Orders required by Tenant's requesting a change in the Final Plans following Final Approval for which Tenant was notified of the cost and agreed. Tenant agrees, within five (5) business days after submission to it of such statement, to execute and deliver to Landlord, in the form then in use by Landlord or Landlord's contractor, an authorization to proceed with the Tenant Improvements. No Tenant Improvements shall be commenced until Tenant has fully complied with the preceding provisions of this Section 8. (a) Payment of Excess Tenant Improvements Costs. Once construction has commenced, Landlord shall submit to Tenant, on a monthly basis, progress payment bills for Excess Tenant Improvement Costs. Said progress payments will be due on the 10th of each following month, with the final payment to be made upon Tenant taking occupancy of the Premises. If Tenant fails to remit the sums so demanded by Landlord pursuant to this Section 8 within the time periods required, Landlord may, at its option, declare Tenant in default under the Lease. If Tenant so desires, Tenant may request and Landlord shall provide, copies of Lien Releases from Landlord prior to payment of Excess Tenant Improvement Costs. Tenant shall retain from progress payment bills a percentage of ten percent (10%) until after final acceptance of the project by Tenant, which acceptance shall not be unreasonably withheld, conditioned or delayed. Within five (5) days of final acceptance, but in no event later than thirty (30) days after Substantial Completion, all retention funds shall be paid to Landlord at Landlord's place of business. 9. Inspection. After Landlord has completed the construction of the Tenant Improvements (excepting punch list items) and again thirty (30) days after the Premises are Substantially Complete ("Second Time"), in each case following two (2) business days' advance written notice from Tenant to Landlord, Landlord shall cause the Contractor to inspect the Premises with a representative of Tenant and complete a punch list of unfinished items of the Tenant Improvements. Authorized representatives for Landlord and Tenant shall execute said punch list to indicate their approval thereof. The items listed on such punch list shall be completed by the Contractor within thirty (30) days after the approval of such punch list or as soon thereafter as reasonably practicable. 10. Clean-Up Expenses. Upon Substantial Completion of the Tenant Improvements, Landlord shall thoroughly clean the Premises. The costs of the cleaning provided by Landlord pursuant to this Section shall not be included in Operating Expenses for the Building prior to Tenant's occupancy of the Premises. 1. The sidewalks, walks, plaza entries, corridors, malls, concourses, ramps, and other Common Areas of the Shopping Center shall not be obstructed or used by Tenant for any purpose other than ingress and egress to and from the Demised Premises. 2. All deliveries or shipments of any kind to and from the Demised Premises, including loading and unloading of goods, shall be made only by way of the rear of the Demised Premises or at any such reasonable location designated by Landlord, and only at such reasonable times designated for such purpose by Landlord. Trailers and/or trucks servicing the Demised Premises shall remain parked in the Shopping Center only during those periods reasonably necessary to service Tenant's operations, and then only in locations designated by Landlord. 3. Tenant shall not install any resilient tile or similar floor covering in the Demised Premises except with prior approval of the Landlord. The use of cement or other similar adhesive material is expressly prohibited. 4. No additional locks or bolts of any kind shall be placed on any door in the Shopping Center or the Demised Premises and no lock on any door therein shall be changed or altered in any respect without the prior written consent of Landlord not to be unreasonably withheld. Landlord shall furnish two keys for each lock on exterior doors to the Demised Premises and shall, on Tenant's request and at Tenant's expense, provide additional duplicate keys. All keys shall be returned to Landlord upon the termination of this Lease and Tenant shall give to Landlord the explanations of the combinations of all safes, vaults and combination locks remaining with the Demised Premises. Landlord may at all times keep a pass key to the Demised Premises. All entrance doors to the Demised Premises shall be left closed at all times and left locked when the Demised Premises are not in use. 5. Tenant shall not place a load upon any floor of the Demised Premises which exceeds the load per square foot which such floor was designed to carry and which is allowed by law. Mechanical and electrical equipment belonging to Tenant which cause noise, vibration, electrical or magnetic interference, or any other nuisance that may be transmitted to the structure or other portions of the Shopping Center or to the Demised Premises to such a degree as to be objectionable to Landlord or which interfere with the use or enjoyment by other tenants of their premises or the public portions of the Shopping Center shall be placed and maintained by Tenant, at Tenant's expense, in settings of cork, rubber, spring type, or other vibration eliminators sufficient to eliminate the noise or vibration. 6. The toilet rooms, urinals, wash bowls and other apparatus shall not be used for any purpose other than for which they were constructed and no foreign substance of any kind whatsoever shall be thrown therein, and the expense of any breakage, stoppage, or damage resulting from the violation of this rule shall be borne by Tenant. 7. Initial move-in refuse from inventory, including but not limited to packing crates, shall be removed at Tenant's sole cost and expense. Any wet trash, including but not limited to food debris, is to be placed in plastic bags and tied before being placed in trash containers. All boxes are to be broken down before being placed inside the containers. Sidewalk containers are not for personal use. Tenant, or the employees of Tenant shall not at any time place, leave or discard any rubbish, paper, articles or objects of any kind whatsoever outside the doors of the Demised Premises or in the corridors or walks of the Center. In the event any item is left at the rear of the Demised Premises or at the base of a refuse container and it can be determined to which tenant it belongs, Landlord has the right to charge that tenant the cost to have it removed. Unless a container is marked by a tenant paying individually and separately for trash collection, containers are for all Shopping Center tenants and do not belong to any one tenant. The exterior areas immediately adjoining the Demised Premises shall be kept clean and free from dirt and rubbish by Tenant and its employees, and Tenant shall not place or permit any obstructions or merchandise in such areas. No debris shall be swept or removed from the Demised Premises onto sidewalks or other Common Areas. 8. All services requests are to be reported promptly and directly to Landlord's designated agent during normal office hours, excepting emergencies which shall be reported as soon as practicable. 9. Tenant shall not place, or cause or allow to be placed, any signs, placards, banners, flags, pictures, advertisements, notices or lettering whatsoever, in, about or on the exterior of the Demised Premises or Shopping Center except in and at such places as may be consented to by Landlord in writing or as allowed by the Signage Criteria for the Shopping Center promulgated by Landlord from time to time. Any such signs, placard, advertisement, picture, notice or lettering so placed may be removed by Landlord without notice to and at the expense of Tenant. All lettering and graphics on doors shall conform to the Signage Criteria. 10. No awnings, draperies, shutters or other interior or exterior window coverings that are visible from the exterior of the Demised Premises may be installed by Tenant without Landlord's prior written consent. 11. Landlord shall have the right to prohibit any advertising by Tenant which, in Landlord's opinion, tends to impair the reputation of the Shopping Center or its desirability for retail use and, upon written notice from Landlord, Tenant will refrain from or discontinue such advertising. 12. Tenant shall not bring or permit to be brought or kept in or on the Demised Premises or the Shopping Center any inflammable, combustible, corrosive, caustic, poisonous, explosive or hazardous substance (except for cleaning solutions customarily used in Tenant's business, and provided that Tenant only maintains on the Demised Premises quantities necessary for such use and Tenant complies with all applicable laws governing the use, storage and disposal thereof) or cause or permit any odors to permeate in or emanate from the Demised Premises, or permit or suffer the Demised Premises to be occupied or used in a manner offensive or objectionable to Landlord or other occupants of the Shopping Center by reason of light, radiation, magnetism, noise, odors and/or vibrations, or interfere in any way with other tenants or those having business in the Shopping Center. 13. Canvassing, soliciting or peddling in the Shopping Center is prohibited and Tenant shall cooperate to prevent same. 14. Tenant shall give, as soon as practicable, notice to Landlord in case of theft, unauthorized solicitation or accident in the Demised Premises or in the Shopping Center or of defects therein or defects in any fixtures or equipment, or of any known emergency in the Shopping Center. 15. Landlord reserves the right to deny entrance to the Shopping Center or remove any person or persons from the Shopping Center in any case where the conduct of such person involves a hazard or nuisance to any tenant of the Shopping Center or to the public or in the event of fire or other emergency, riot, civil commotion or similar disturbance involving risk to the Shopping Center, tenants or the general public. 16. No portion of the Demised Premises shall at any time be used or occupied as sleeping or lodging quarters. No animals or birds, with the exception of guide dogs accompanying visually handicapped persons, shall be brought or kept in or about the Demised Premises. Unless otherwise expressly provided for in the Lease, Tenant shall not do any cooking on the Demised Premises. Tenant may, however, for the use of its employees, operate a coffee bar and allow the use of a microwave oven. 17. Tenant shall at all times keep the Demised Premises neat and orderly. 18. Tenant shall not use or permit any portion of the Demised Premises to be used for any use other than those specifically granted in the Lease. 19. Landlord shall have the right to designate and restrict the areas available within the Shopping Center for the parking of vehicles by Tenant, its employees, agents, visitors and invitees. 20. Tenant shall be responsible for the compliance with these rules and regulations by the employees, agents, customers and invitees of Tenant. 21. In the event of any conflict between the terms of these rules and regulations and the express provisions of Tenant's Lease, the express, applicable provisions of the Lease shall control. 22. Landlord reserves the right, without the approval of Tenant, to add new rules and regulations, and to waive, rescind, add to and amend any rules or regulations with respect to any tenant or tenants, as Landlord in its sole judgment shall from time to time find necessary or appropriate in order to provide for the safety, protection, care and cleanliness of the Shopping Center, the operation thereof, the preservation of good order therein, and the protection and comfort of tenants and their employees, agents, customers and invitees, which rules and regulations, when made and written notice thereof is given to Tenant, shall be binding upon it in like manner as if originally herein prescribed, except to the extent such additional rules or regulations conflict with the express provisions of this Lease. The amendment or waiver by Landlord of any rules or regulations for the benefit of any particular tenant of the Shopping Center shall not be construed as a waiver of such rules and regulations in favor of this Tenant or any other tenant, nor prevent Landlord from thereafter enforcing any such rules and regulations against any or all of the tenants in the Shopping Center. 23. No Tenant shall perform construction, remodeling and/or renovation projects to its premises during the period from _____________ to _______________ of each year, without the prior written consent of Landlord.